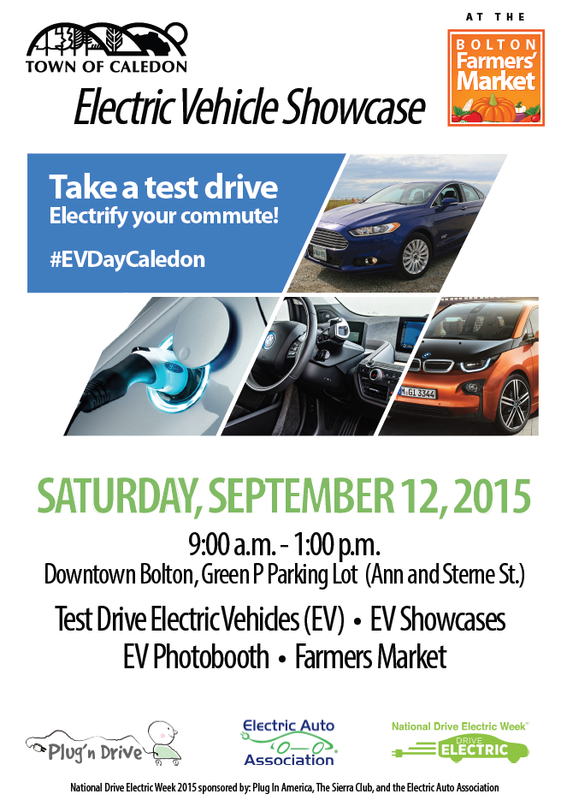 EV Day Caledon was the first event of it's kind held in the community. This event was hosted by the Town of Caledon, partnered with Plug n'Drive and the Bolton Farmers Market. We had 6 electric and plug in vehicles and included an EV Photobooth and facepainting feature (which the kids in the community were very excited about). We held a random ticket draw to win professional soccer league tickets (Toronto FC)to an upcoming game, and handed out giveaways courtesy of National Drive Electric Week and Nissan Leaf. The event attracted interest from 2 of the local newspapers who came out and spoke to event organizers and took photographs of the event. Many residents also exclaimed their newly found interest in electric vehicles and will consider them during their next vehicle purchase, which is what the Town was hoping for. EV Day Caledon received support from the Caledon Mayor Thompson, Councillor Groves, and Councillor Mezzapelli. The Green Party Candidate, Nancy Urekar, and the Conservative Party Candidate, David Tilson also attended the event. The biggest challenge faced during the event was the weather. It was a rainy and cold Saturday morning and afternoon in Ontario, which prohibited the amount of attendees, given that it was an outdoor event. All in all, the organizers as well as Caledon residents highly enjoyed this event! It is important to the Town to drive awareness and education about the environmental benefits provided by electric vehicles. 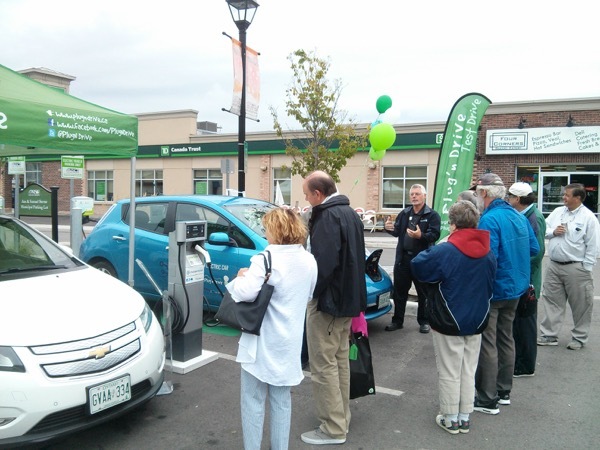 Ron Groves, Education and Outreach Manager at Plug'n Drive explaining features of the electric vehicles to Caledon residents at the newly installed electric vehicle charging stations in the Downtown Bolton Municipal Parking lot. In partnership with the Bolton Farmers Market and Plug N’Drive Ontario, we'll have electric vehicles available for display and test drives as well as electric vehicle owners to share their experience driving electric. Registered attendees report 45,000 electric miles driven.